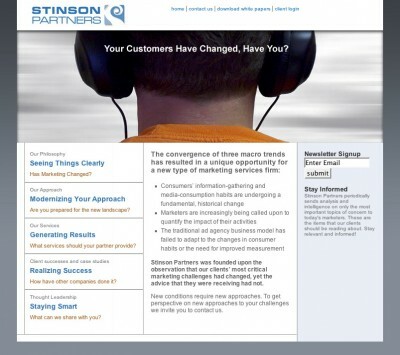 Stinson Partners is a marketing services consultancy dedicated to the idea that technology is transforming marketing. 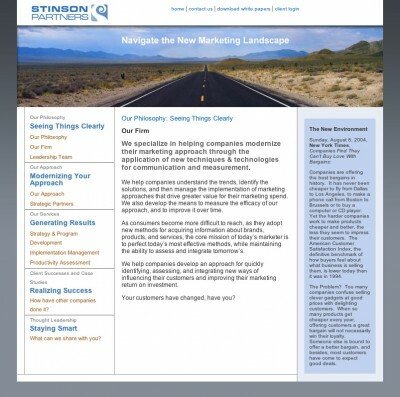 The firm is led by Michael Clark, former Vice-President of Strategic Marketing Services for Modem Media, Inc., an expert at helping companies modernize their marketing approach through the application of new techniques & technologies for communication and measurement. 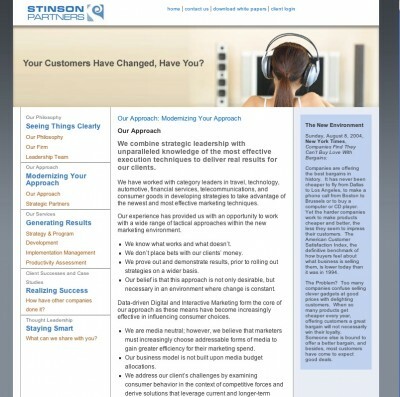 Ideacodes provided strategy, design and development for the Stinson Partners website. Consulting, information architecture, concept designs, website design, front-end code and content management system (CMS) implementation. Working with ideacodes was a pleasure and we would recommend them highly for any project having to do with web design and web strategy. They were incredibly flexible and professional, able to quickly incorporate our essence and ideas into their designs, and very willing to consider directional changes without missing a step. We will be working with them again in the future.